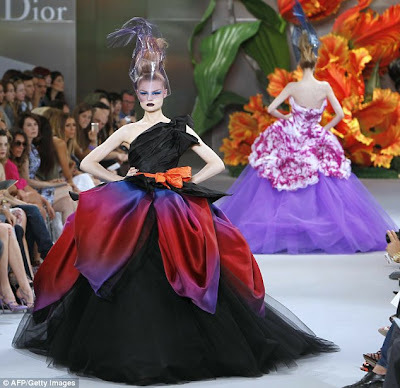 Just looking at some of images from John Galliano's couture show for Christian Dior that took place in Paris today and to be honest, I'm lost for words; no superlatives can describe just how much I rate this collection. Galliano told press at the show he was 'having a floral moment', but unlike the floral printed fashions flooding the high street this summer, Galliano's dresses literally took the form of upturned wildflowers in bloom, with giant 'petals' and carnation-inspired ruffles. Some of the outfits were accessorized by celephone head pieces designed by milliner Stephen Jones, evoking visions of celephone wrapped bouquets fresh from the florist (although they also had a hint of the quality street about them too!) Fittingly, Galliano was inspired by the beautiful blooms found in the garden at Christian Dior's childhood home in Les Rhumbs, Normandy, when designing the collection. 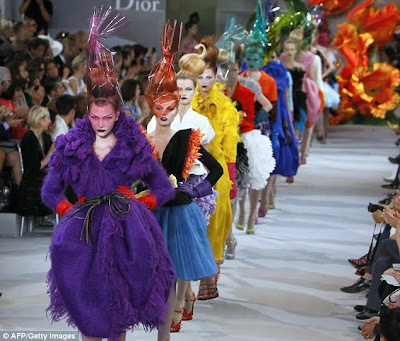 For me, Galliano's show once again proves that haute couture has a place to play in today's fashion industry; who could fail to be inspired by such a vibrant vision of beauty? If I'm not dressed as a human tulip next S/S, I will be severely dissapointed!